In 2006, U.S. Chief of Naval Operations, Admiral Mullen, put forward the idea of the navies of the world uniting to fight shared challenges to promote freedom of the seas. While today’s attention focuses more on great power competition and less on trans-national terrorism and piracy, the idea of like-minded nations fighting together for freedom of the seas remains. The U.S. often fights wars as part of a coalition of like-minded states, and has frequently done so for over a century. The U.S. Navy has not fought a naval war alone since the Spanish-American-Cuban War of 1898. From the Boxer Rebellion to the War on Terror, the U.S. fights in conjunction with its allies and partners. The third theme of A Design for Maintaining Maritime Superiority 2.0 is, “The Navy fighting with the Joint Force and with our allies and partners will control the high end of maritime conflict.” High capability allies increase the lethality of U.S. forces. Allied forces can complement a carrier strike group (CSG) by providing additional air defense units, contribute ships and Marines to amphibious operations, and support Theater ASW with submarines, maritime patrol aircraft, and surface ships. Many allies also specialize in areas the US Navy is weak in, such as mine warfare. Despite a lengthy pedigree of combined naval operations, the U.S. Navy must continue focusing on interoperability with allies. The U.S. Navy’s attention must remain firmly set on interoperability. It is a mindset that must be consistently reinforced by leaders and sailors operating in a combined environment. The operational staffs at CSGs and Destroyer Squadrons are vital to the successful execution of combined operations because they write the operational tasking messages (OPTASKs) and control the communications paths that enable our allies to fight with us. Without being able to communicate and operate together and understand the capabilities of allies, the U.S. Navy will not be able to take advantage of allied navy skills in a distributed environment. There are four types of interoperability: Strategic, Operational, Tactical, and Technological. Strategic Interoperability is durable relationships with partner nations, organizations like NATO, or Mutual Defense Treaty relationships in Asia. These high level agreements indicate shared mutual interests and a long-term desire to cooperate and determine that an operation is required. Operational Interoperability can be achieved through a myriad of ways: a combined fleet or dividing tasks and territory between nations to accomplish individually. Tactical Interoperability is operating ships or aircraft from different countries together, and the technological level is the data links, radars, or weapons that they utilize to accomplish their missions. Understanding the capabilities and limitations of allied platforms is vital for effective use of those assets.2 Without an understanding of what partner units can do, both sides will be incredibly frustrated during the operation. The Allied Interoperability and Coordination Guide published by the NATO Combined Joint Operations from the Sea Center of Excellence gives specific examples of areas that have given combined forces problems during U.S. naval exercises. Unsurprisingly, many of those examples are communications related. Today’s Allies have modern, capable warships. If one was reading Janes and saw “AEGIS Weapons System, SPY-1 Radar, SM-2 Missile, and Mk-41 Vertical Launching System (VLS),” one might assume that it was a U.S. Navy ship. But today, Japan, the Republic of Korea, Australia, Spain, Denmark, and Norway have warships with the AEGIS Weapons System, SPY-1 radars, and vertical launch cells. Italy, France, the United Kingdom, the Netherlands, and Germany all have ships that have similar combat system capabilities. These ships have Link-11, Link-16, and satellite communications. Over 18 nations operate the P-3 Orion, Australia and India operate P-8 Poseidons, and the U.K. is expected to deploy them by 2020. Nine nations’ navies and air forces are buying variants of the F-35 Lightning II aircraft. Between the new ships and the new planes, the U.S. and its allies are technologically interoperable. 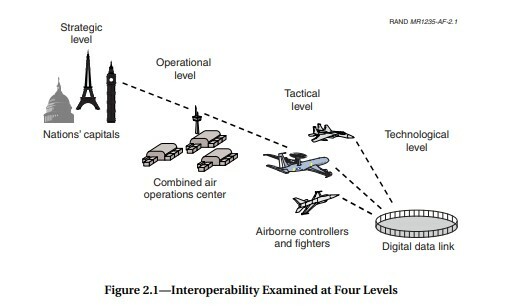 The main interoperability friction points are communications and doctrine. Because of defense budgets and population size, many U.S. allies expect to fight in a combined task force. For example, Denmark has deployed Iver Huitfeldt-class frigates in support of U.S. and French CSGs, and plans to do the same with the British. These ships have regularly made cooperative deployments with the United States Navy. These frigates have AEGIS and SPY and are capable air defense platforms. In 2013, another capable air defense platform, the FGS Hamburg made a cooperative deployment with the USS Dwight D. Eisenhower CSG in 2013, the first cooperative deployment for the Bundesmarine.3 The Spanish frigate Mendez Nunez is scheduled to deploy with the Abraham Lincoln CSG.4 Cooperative deployers go through their own domestic training cycle, followed with certification by the British Royal Navy’s Flag Officer Sea Training (FOST), before sailing to the United States to participate in a Composite Unit Training Exercise (COMPTUEX) and follow-on deployment. Large scale exercises such as BALTOPS in Europe, KEEN SWORD and COBRA GOLD in the Pacific, and UNITAS in the Americas are a chance to flex all four levels of interoperability. The strategic aspect includes messaging that partner nations are resolved to work together and are ready and willing to fight tonight together. At the operational and tactical level, these exercises give navies a chance to train together, build relationships, and work through interoperability challenges. These relationships, established through frequent exercises, enable confidence in both forces’ ability to fight together. This trust is vital to teamwork and success in a future conflict. Tactical interoperability is the ability to communicate and operate together. The ability to communicate effectively is a complex, never-ending battle. HF, UHF, EHF, SHF, and VHF paths are favored by different nations for different missions and different nets. The U.S. military’s large satellite constellation enables the U.S. Navy to operate at sea with a focus on UHF, SHF, and EHF communications. This enables internet bandwidth which further enables the dominance of SIPR chat as a means of C2. The destroyer’s Tactical Action Officer (TAO) is inundated with chats in multiple chat rooms from higher headquarters expecting reports on everything from enemy actions to hourly potable water percentages or other minutiae. SIPR is a U.S.-only domain which precludes allies from participating. U.S. comfort in SIPR utilization means that oftentimes allies are left outside of the communications chain. The U.S. also operates BICES and CENTRIX computer networks for use with allies, however there are fewer computers available aboard ship for use, which restricts the ability to operate those systems. This issue can be mitigated by focusing on voice communications. Some commanders utilize chat and then use voice when they remember to include their allies in the operation. This wastes time and sidelines allies, leading to frustration. It is better to utilize the radio nets instead of chat for C2. U.S. ships are used to operating a myriad of circuits simultaneously, but not all partner nation ships have the same capability to use a broad spectrum of circuits. Understanding the limitations of partner nation radio shacks to limit the number of circuits U.S. vessels use is important for designing stable and effective comms architecture. Cryptographic keying material (crypto) is another major issue for successful communications. One cannot communicate effectively if the crypto is wrong. Different types of crypto rotate at different times and sailors have to understand the nuances of those rotations. 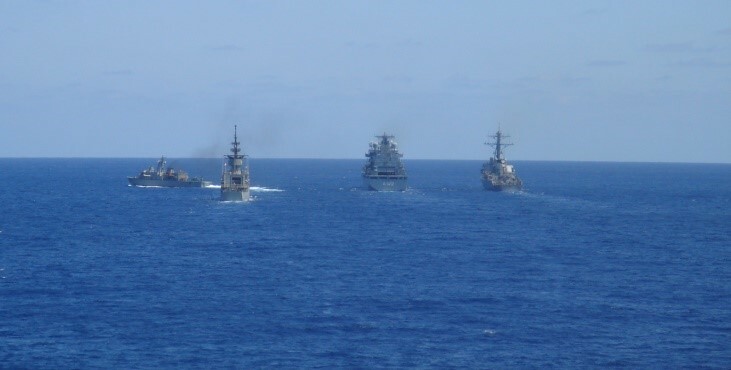 As an example, during an operation, two U.S. ships and one allied ship were conducting an exercise. The two U.S. ships did not shift crypto when they were supposed to, but the allied ship did. That allied ship mysteriously fell out of the net and no one knew why. The two U.S. ships did not switch, and said it was the allied ship’s fault they dropped out because the two U.S. ships could still communicate. Eventually, it was realized that the two U.S. ships had not shifted crypto within periodicity, and once crypto had been shifted, comms were restored. This problem is more pronounced when operating with aircraft that cannot reload crypto until they return home which eliminates an asset from the operation. The N6 community should focus on ensuring that OPTASK Comms are written with interoperability in mind. Ship’s radio shacks must be trained to seamlessly utilize allied crypto. When a ship drops communications, all ships in the squadron should verify that their settings are correct and not assume the other person is wrong. Most importantly, the staff should prioritize voice communications over chat. Emphasis on these things will enable the commander to turn an allied warship from a liability into a useful asset. Once allies can communicate, it is time to operate together. Interoperability is a mindset. Commander’s intent can drive a CSG or DESRON to be interoperable. During exercises, the CSG and DESRON can demand that the training and doctrine commands, like Surface and Mine Warfare Development Center (SMWDC), ensure that their support during exercises is releasable to allies. The CSG and Destroyer Squadron must understand the capabilities and limitations of partner nation ships and aircraft and task them appropriately. Many naval vessels are multi-mission, however like most things, some ships are more appropriate for certain missions. A NATO air defense frigate with AEGIS that lacks a towed array sonar might be better suited as plane guard than part of an ASW search and attack unit. U.S. forces are trained on U.S. publications such as Naval Tactical Techniques and Procedures (NTTP) and Naval Warfare Publications (NWPs). They typically receive less training on Allied Tactical Publications (ATPs). Yet NATO nations expect to fight as a unit and train from the ATPs. U.S. forces operate globally and tend to focus on their own doctrine which is similar to, but often slightly different from NATO doctrine. Part of this is a releasability issue. Since the U.S. partners with nations like Australia, Japan, and the Republic of Korea that are non-NATO countries, the U.S. needs doctrine it can release to them, but also doctrine that is the same in the Atlantic and Pacific Fleets. If OPTASKs are written using only U.S. doctrine it makes it more difficult to share with allied cooperative deployers. If a CSG has a cooperative deployer, it makes sense to utilize ATPs instead of NTTPs and ensure the OPTASKs are releasable to NATO, reducing the time required by short-staffed Foreign Disclosure Officers. The process of releasing critical information to cooperative deployers must be improved so that CSG staffs on deployment can rapidly transfer information required for day-to-day operations to allies. OPTASKs can be written from ATPs or U.S. publications. The CSG’s OPTASKs should be written early enough for U.S. and allied ships to train to them. ATP-based OPTASKs will require adjustment for the U.S. ships, but will seamlessly incorporate any allied ships for operations on deployment. U.S. ships are supposed to utilize allied publications and procedures when operating with NATO allies; the commander should ensure that his OPTASKs are written to follow that. U.S. Arleigh Burke Flight IIA warships lack Harpoon missiles and a significant surface strike capability. Most NATO frigates that are equipped with Harpoon or Exocet can provide additional missiles for the surface fight. The Danish Iver Huitfeldt-class frigate carries 16 Harpoon missiles, the equivalent of two U.S. cruisers or FLT I DDGs combined. This large quantity of Harpoons greatly eases the salvo sizes required for successful engagements. The U.S. Navy needs to ensure that once new Distributed Maritime Operations concepts, C4I processes, and techniques are developed, they are released to regular NATO cooperative deployers like Denmark, the Netherlands, Germany, France, Spain, Italy, and the United Kingdom so that coalition assets strengths can be utilized. The Korean Theater of Operations provides an interesting confluence of interoperability. 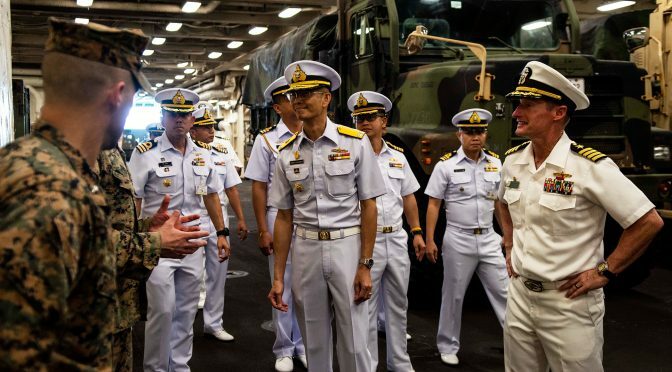 The U.S. Navy regularly works with the ROK Navy and is interoperable with them, but in the event of a war, United Nations Command expects 11 United Nations Sending States – nations including European nations, Australia, Thailand, and the Philippines – to contribute forces to the campaign. Currently there are few opportunities for European and ROK navies to train together. There are occasional passing exercises (PASSEXes) in CTF 151 and the occasional Tri-lateral Exercise when a European ship passes through the KTO or a Korean ship visits Europe, but those opportunities rarely stress complex interoperability issues like communications and tactical data links. There has not been much discussion over what doctrine will be used, including NATO Allied Tactical Publications or U.S. doctrine, and how to incorporate nations like the Republic of Korea, Thailand, and the Philippines. One area where the United Nations Command has been successful in incorporating U.N. Sending States is mine warfare. 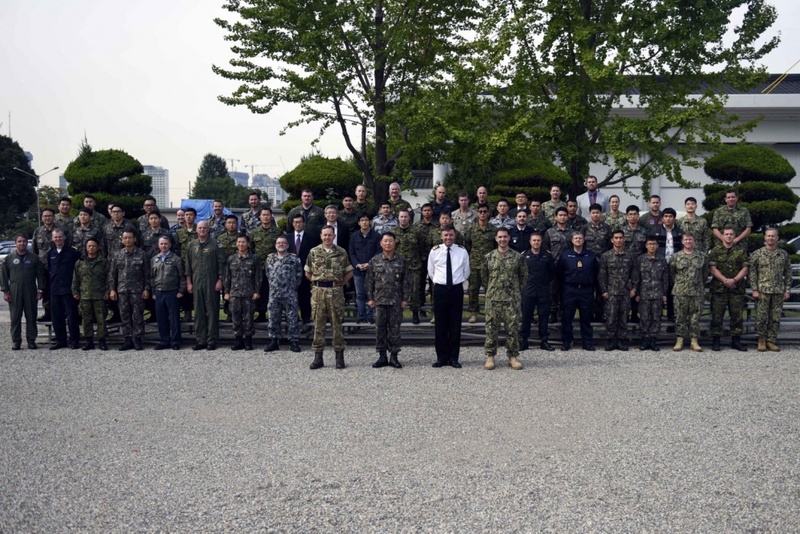 Since 2014, the U.S. and ROK Navies, and United Nations Sending States have come together to conduct mine countermeasure exercises familiarizing themselves with the local conditions and operating as a coalition. As United Nations Command ramps up that exercise, the doctrine and releasability aspects will hopefully solve themselves, however one must identify issues to solve it. As fleet sizes around the world decline, Admiral Mullen’s thousand ship-navy vision becomes more important and CSGs composed of coalition partners will become more common. Since many U.S. allies operate the same or similar aircraft and ships, these coalitions are technologically interoperable, but tactical and operational interoperability starts with the commander and his intent. As the U.S. Navy creates new C4I systems and tactics, they need to be rapidly released to close partners to ensure the continued interoperability of naval forces. With good communications and releasable tactics, these nations can make excellent contributions to the fight. Without emphasis on partner nations’ interoperability, the U.S. Navy will waste valuable assets, and eventually receive fewer coalition assets on deployment. LT Jason Lancaster is an alumnus of Mary Washington College and has an M.A. from the University of Tulsa. He is currently serving as the N8 Tactical Development Officer at Commander, Destroyer Squadron 26. The above views are his own and do not reflect the position of the Navy or Department of Defense. 2. Hura, Myron, Gary W. McLeod, Eric V. Larson, James Schneider, Dan Gonzales, Daniel M. Norton, Jody Jacobs, Kevin M. O’Connell, William Little, Richard Mesic, and Lewis Jamison, Interoperability: A Continuing Challenge in Coalition Air Operations. Santa Monica, CA: RAND Corporation, 2000. https://www.rand.org/pubs/monograph_reports/MR1235.html (Accessed 31JAN19). 3. Gorman, Tim, Hamburg First German Ship to Deploy in U.S. CSG, 3Apr2013. https://www.navy.mil/submit/display.asp?story_id=73121 (Acessed 31JAN19). 4. NATO, Allied Interoperability & Coordination Guide Version 1.0, November 2018. 5. Richardson,John M, A Design for Maintaining Maritime Superiority Version 2.0, December 2018. 6. Gause, Kennth, U.S. Navy Interoperability with Its High End Allies, Alexandria VA, Center for Naval Analyses, October 2018, https://apps.dtic.mil/dtic/tr/fulltext/u2/a468332.pdf (Accessed 31JAN19). 7. Jean-Gilles, Jacques,Carrier Strike Group Twelve Welcomes Spanish Frigate Mendez Nunez to Naval Station Norfolk, 14Jan2019, https://www.dvidshub.net/news/307019/carrier-strike-group-12-welcomes-spanish-frigate-mendez-nunez-naval-station-norfolk, (accessed 16FEB19).